The Douglas C-124 Globemaster II, nicknamed "Old Shakey", was a heavy-lift cargo aircraft built by the Douglas Aircraft Company in Long Beach, California. The C-124 was developed from 1947 to 1949 by Douglas Aircraft from a prototype created from the WWII-design Douglas C-74 Globemaster and based on lessons learned in the Berlin Airlift. The aircraft was powered by four large Pratt & Whitney R-4360 piston engines producing 3,800 horsepower each. 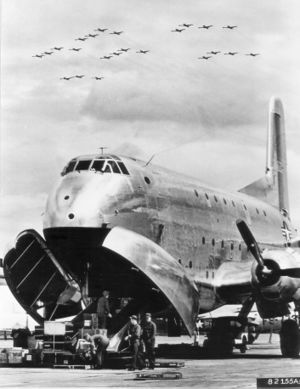 The C-124s design featured two large clamshell doors and a hydraulically-actuated ramp in the nose as well as a cargo elevator under the aft fuselage. 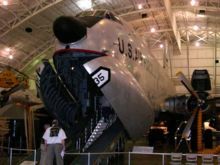 The C-124 was capable of carrying 68,500 lb of cargo, and the 77 ft (23.5 m) cargo bay featured two overhead hoists, each capable of lifting 16,000 lb (7,000 kg). As a cargo hauler, it could carry tanks, guns, trucks and other heavy equipment, while in its passenger-carrying role it could carry 200 fully equipped troops on its double decks or 127 litter patients and their attendants. It was the only aircraft of its time capable of transporting heavy equipment such as tanks and bulldozers without prior disassembly. The first flight of a C-124 took place on November 27, 1949. The C-124A was followed in service by the C-124C, which featured more-powerful engines as well as wingtip-mounted combustion heaters that provided cabin heating and wing and tail surface deicing, and an APS-42 weather radar in a distinctive nose "thimble." These latter improvements were eventually retrofitted to the C-124As. First deliveries of the 448 production aircraft began in May, 1950 and continued until 1955. The C-124 was operational during the Korean War and also used to assist supply operations for Operation Deep Freeze in Antarctica. They performed heavy lift cargo operations for the US military worldwide, including flights to Southeast Asia, Africa and elsewhere. From 1959 to 1961 they transported Thor missiles across the Atlantic to England. The C-124 was also used extensively during the Vietnam War. The USAF Strategic Air Command had C-124 Globemasters in service from 1950 through 1962. Most were passed to the Air National Guard and Air Force Reserve by 1970. The first ANG unit to receive the C-124C was the last Air Force unit to retire their aircraft (s/n 52-1066 & 53-0044) in September, 1974. One preserved aircraft s/n 52-1066 is at the National Museum of the United States Air Force at Wright-Patterson Air Force Base near Dayton, Ohio. This aircraft is stored indoors with the clamshell doors open, allowing visitors to go inside. This was one of the last two Air National Guard C-124's to be retired in 1974. The aircraft is displayed as s/n 51-0135. The Travis Air Museum, located inside Travis Air Force Base near San Francisco, California was given a C-124 s/n 52-1000 in August, 1982. The aircraft had been stored for many years outside at the Aberdeen Proving Grounds in Maryland where it was used as a storage shed. Transporting the aircraft by ground to California would have been prohibitively expensive so the decision was made to fly the aircraft to the museum. Volunteers joined with members of the 116th Tactical Fighter Wing from Dobbins Air Force Base to restore the C-124 to an airworthy and ferryable condition. The aircraft was then ferried from Aberdeen to Dobbins AFB in Georgia where members of the 116th TFW completed the aircraft's restoration. The aircraft was then flown cross country to Norton Air Force Base in California. After a photo session over the Golden Gate Bridge the C-124 arrived at the Travis Air Museum at exactly 2:00 PM on June 10, 1984. This was the first recorded flight of a C-124 in nearly a decade. The museum and airpark are located within Travis Air Force Base, and for reasons of security, access to the museum has been greatly reduced since September 11, 2001. As a result the museum is currently exploring plans to relocate to a site off base. A C-124 s/n 49-0258 is currently being restored at the Air Mobility Command Museum located at Dover Air Force Base near Dover, Delaware. This is the oldest surviving C-124. In July, 2005 museum volunteers reattached the aircraft's wings and clamshell doors, and the restoration is now nearing completion. A C-124 s/n 52-1004 is displayed at the Pima Air Museum in Tucson, Arizona. A C-124 s/n 51-0089 is on display at the Museum of Aviation located at Warner Robins Air Force Base in Georgia. A C-124 s/n 52-0994 is on display at the McChord Air Museum located at McChord Air Force Base in Tacoma, Washington. This aircraft was formerly under civilian registration N86599 and located for many years at the Detroit Institute of Aeronautics. On October 9, 1986 the aircraft was flown non stop from Selfridge Air National Guard Base near Detroit, Michigan to McChord Air Force Base. While flying over Washington State the aircraft was joined by a C-130 and C-141 of the 62nd Military Airlift Command. This is the last recorded flight of a C-124. The museum has been subject to restricted access since September 11, 2001. A C-124 s/n 52-1072 is on display at the Charleston Air Force Base airpark located in Charleston, South Carolina. A C-124 s/n 53-0050 is currently undergoing restoration at the Hill Aerospace Museum located at Hill Air Force Base in Utah. The aircraft was rescued from Aberdeen Proving Grounds in Maryland in 1992 where it was planned to be used for ballistics testing. A C-124 s/n 52-0943 is on display at the Seoul Military Academy Museum at Sacheon Air Force Base in Seoul, South Korea. A C-124 s/n 53-0044, one of the last two Air National Guard C-124's to be retired in 1974, was located for many years on the corner of Kovel Lane and Reno Avenue near McCarran International Airport in Las Vegas, Nevada. Numerous plans were made to use the aircraft for advertising, display, and even as a restaurant, but nothing came of this, and over the years the aircraft's condition deteriorated. In 1996 an attempt was made by the city of Las Vegas to acquire by eminent domain the 10,500 square foot area where the plane sat. The land was to be used for a highway bypass. The action was postponed during a lengthy court case that was eventually won by the land owner. In 2003 the land was finally sold at a substantially greater price to the City of Las Vegas to accommodate the bypass and the C-124 was scrapped shortly afterwards. Several of the aircraft's gauges and instruments were later sold on eBay. As F-84 Thunderjets fly in the background, a C-124 Globemaster is unloaded in Japan in October 1952. This page was last edited on 6 March 2007, at 00:03.